Do Fish in Aquariums Swim in Freshwater or Saltwater? What are some popular fish that can be raised in aquariums? How do you maintain an aquarium? If you're fascinated by aquariums like we are, you might have WONDERed whether the fish in aquariums swim in freshwater or saltwater. As it turns out, aquariums can be filled with either freshwater or saltwater. It just depends upon what kind of fish you want to raise. There are thousands upon thousands of different types of fish all over the world. Some live in freshwater, such as rivers and lakes, while others live in saltwater oceans. If you want to raise fish in an aquarium, you need to create an environment for them that's similar to their native environment. You can get a variety of different kinds of fish at a local pet store or exotic fish store. 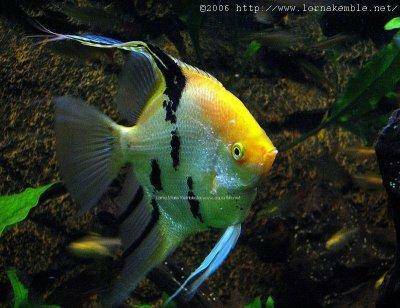 Freshwater fish frequently come from farms where they are raised to be sold in pet stores. Some popular types of freshwater fish include Bettas, Angelfish, Goldfish and Rainbow Fish. Saltwater fish tend to be wild fish from the ocean imported from all over the world. Saltwater fish require a special environment that includes consistent temperature and water conditions. Oceans, because of their size, tend to stay the same most of the time and change very slowly, if at all. To mimic ocean conditions in an aquarium, it's often necessary to use a larger tank that can hold more water. You also have to keep a close eye on the tank's water conditions to make sure water temperature and chemical levels remain constant. Some popular saltwater fish varieties include Lionfish, Clownfish, Seahorses, Eels, Groupers and Angels. Angels, for example, are very beautiful, but they can be very difficult to raise because they are sensitive to even the smallest changes in water quality. With the proper care, though, Angels can live up to 10 years. Just be careful when choosing neighbors for Angels. They get along well with other species, but they don't like other Angels! Raising fish in an aquarium can be a rewarding hobby that provides countless hours of enjoyment. It's not always an easy task, though! Aquariums require daily maintenance. Like all animals, fish require regular feeding. You will also need to monitor the temperature and quality of the water to make sure you're providing a quality home for your fish. And like your room, aquariums need to be cleaned on a regular basis to make sure you maintain a safe environment where your fish can flourish! If you WONDER about tomorrow’s WONDER, then you’ll love tomorrow’s WONDER! Ready for a field trip? If you love fish and would like to learn more about what it takes to raise fish in your very own aquarium, ask the experts! Grab a friend or family member and take a trip to your nearest pet store or exotic fish store. Check out the varieties of fish they sell. Do they have both freshwater and saltwater fish? What kinds of aquariums do they sell? What's the largest aquarium they have at the store? If you were to get an aquarium, what type would you want? What types of fish would you want to raise? Raising fish in an aquarium can be a daunting task. Do you think you're up for the challenge? Be sure to discuss things with your family before taking on the responsibility of an aquarium. Ask the experts at the store what you'll need to do to maintain your tank, so you'll have a clear picture of what's in store for you as an aquarium and fish owner. If you already have an aquarium, we'd love to hear about your fish and see pictures of them! You can share your aquarium and its inhabitants with your Wonder Friends by posting pictures on Facebook. We can't wait to see your aquatic friends! I have a bata fish and I take care of it. It lives in fresh water. Its one year old turning 2 next two months. We're glad you are WONDERing, Alan! It probably depends on the fish. Some common fish are probably not as expensive as fish that are more rare in your area. Perhaps you could ask an adult to take you to a pet shop to see the fish for sale! That's right, Alan! Thank you for commenting! Hey there, Eva! This Wonder of the Day explores two types of fish -- the kind that live in saltwater and the kind that live in freshwater -- and how to care for fish in an aquarium. We hope you enjoy reading it! I wonder how you got the wheel spinning in the aquarium. Where did you get the fish? how is salt water different than regular water? I'm going to get a fish soon! is it easy to take care of a fish? Thanks for responding to Madi's question, al. Keeping the tank and water clean does take work. It's good to weigh the pros and cons before deciding to get an aquarium! Hi wonderopolis I have a million wonders but I can't post them all I have so much! Can you answer this wonder why does candy get you sugared up? Hi wonderopolis I was wodering why do we kill poor innocent deer and why do we only have snow only in the winter? It was a good story to read it told you some good facts about the story I like all the fishes. I like to wonder about dancing too. I do have a favorite thing to wonder about. I love fish and all of their colors!!!!!!!!!!!! It is so cool!!!!! Do all fish like different temperatures in their water? That was a cool video!!!!! I think that tomorrow's wonder will be about pugs!!!! I also like fish but dogs more! Awesome wonder today, HAPPY UN-HALLOWEEN. Oh my gosh love it I love fish and I know more stuff now, I have 20 fish. :) I love fish. Hi this is good but PUT ONE ABOUT SPACE???????????????!!!!!!!!!!!!!!!!!!!!!!!!!!!!!!!!!!! This was a great WONDER. My science class has its own coral tank. I think tomorrow's WONDER is going to be about how the brain works, thinking, or something that needs lots of brain power. WOW! Those fish are as beautiful as can possibly be!!!! I like the wonder of the day because I like fish so much. I liked watching the video because I like sea animals like DOLPHINS!!!!!!!!!!!!!!!!!!!!!!! We really enjoyed today's Wonder. Many of us have or have had fish as pets. We wondered about what kind of fish we'd like to have in our aquariums- goldfish or clownfish (depending on if it was freshwater or saltwater!) We think tomorrow's Wonder will have something to do with thinking, or a superhero named Wonder Man or Wonder Woman! We liked today's WONDER and thought it was cool that a Wonder Family wrote it! We think tomorrow's wonder could be about Alice in Wonderland, Wondering, Wonder Pets, the book Wonder, or maybe even how your brain wonders. We thought the angel fish was colorful and pretty. We also thought the mollies were beautiful. Some of the students in our class have fish tanks at home. We think tomorrow's wonder is going to be about loving school, having fun, pople who wonder. keep in a certain state, position, or activity; e.g., "keep clean"